DISRUPTION iS COMING - DEAL WITH IT. Disruption as a Service (DaaS) offers on going protection from the coming disruption. The key to survival now means building a continuous and dynamic outside-in stream of robust thinking, theory, ways of working, frameworks, and ideas into the core of the organisation. Without this, organisations will be left behind and will become static, uncompetitive and irrelevant. Disruption as a Service (DaaS) consists of eight highly focused disruption services specifically created for an organisation’s specific challenges and opportunities. DAAS is a disruption early warning system which enables our clients to be continuously ready for disruption and preemptively plot the change needed to protect themselves from future disruptor threats. curating a focused schedule of DISRUPTION THINKING, THEORY & PRACTICE. Organisations are being buffeted by all kinds of disruption. Applying a PEST (Political/ Environmental/ Social/ Technological) disruption model to the fours pillars of the organisation (Customer Experience/Employee Experience/Operations/Technology) allows us to research and predict future disruptions from all angles. We can then curate a focused schedule of disruption thinking, theory and practice for the organisation in order to prepare and protect it from the future. DaaS packages range from total protection to light protection - and can be created bespoke depending on the needs of the organisation. The Future Strategy Club assures and delivers the schedule of thinking, theory and practice using expert advisors and specialists from across relevant industries and specialisms. 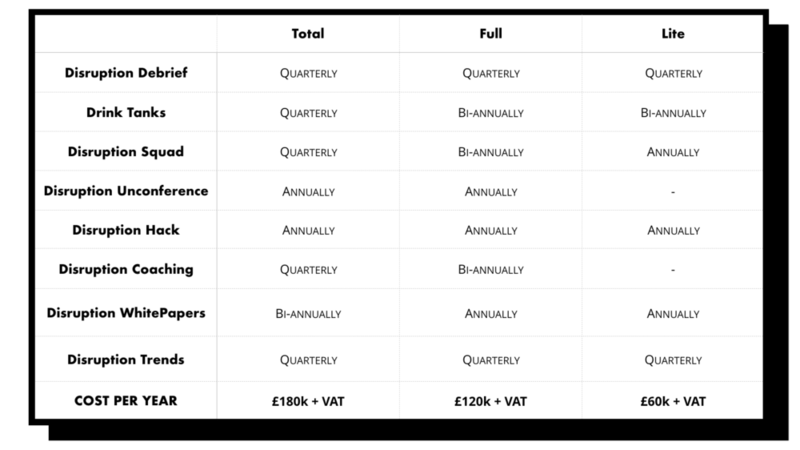 An EXAMPLE DaaS TOTAL Year Planner. DaaS can be planned to fit in with the organisation’s calendar and around key events and milestones.